How to plot the rate of change or the incline of a line plot? Hi there, there is probably some statistic or mathematical concept I am missing here. I’m plotting AWS/Billing Estimated charges in Grafana, but I am having a hard time determining if the slope if increasing or not. Basically I want to plot the graph in such a way, that I am aware of the rates of change. I.e. if spending goes up, I can notice that increase. If spending goes down, I should be able to visualise it too. How do I do this? There must be some calculation I can perform? Yes the “counter reset will generate high negative rate peak” and I see that. But I am not really able to see anything else. Perhaps it’s being consistent with no jumps is a good thing. 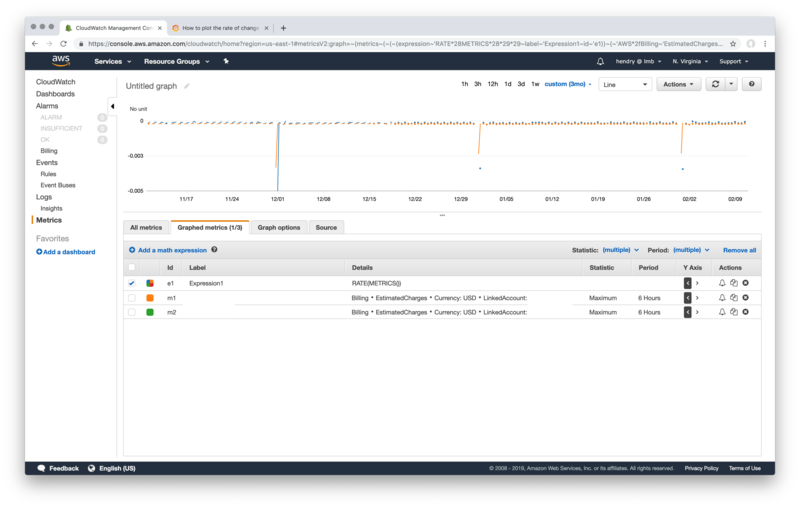 Nonetheless, I am a little puzzled how to recreate the Grafana, because the AWS console falls down when you need to monitor as I do, several accounts. Any tips for Grafana? I couldn’t grok the Expression field, is that’s what I am supposed to use. That is OK - it calculates rate per second, so don’t expect any high numbers, but pretty small decimal numbers. For example 10k USD per month = ~0.003 USD per second. You, can still multiply result (*1000) to have better graphable values. Ok, I agree RATE(METRICS())*1000 in CloudWatch is better. But I am still puzzled how to get this shown in Grafana. Is it not possible to do these calculations? I notice Prom can pull them off, but I am going direct from Grafana to CloudWatch sources. Cloudwatch math is supported https://github.com/grafana/grafana/issues/11487 I don’t see any showstopper. Thanks for you help I think I figured it out now with your help! Do please follow up if this could be further improved!